When your iPhone can't send text messages, you feel cut off from friends and family. And what are you supposed to do? Make a phone call?! Yuck. There are many reasons that your iPhone might not be sending texts properly. Luckily, most of the ways to get your iPhone texting again are pretty simple. If your iPhone can't send text messages, try these tips, in this order, to fix it. 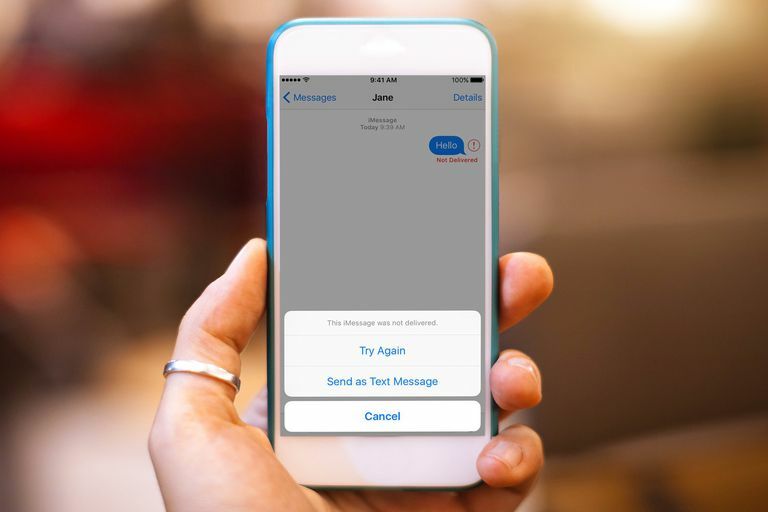 The iPhone can send texts using Apple's iMessage network or using standard SMS texts to non-Apple devices. The tips in this article apply to both kinds of texting. Your iPhone can't send text messages if it's not connected to either a cellular phone network or a Wi-Fi network. If your texts aren't going through, this is where to start. Look at the top left corner of your iPhone's screen (top right on iPhone X, XS, and XR). The bars or dots there show the strength of the cellular connection you have. The Wi-Fi indicator shows the same thing for Wi-Fi networks. A low number of dots or bars, or no phone company name, means you might not be connected to a network. Swipe up from the bottom of the screen (or top right, on iPhone X, XS, and XR) to reveal Control Center. Tap the Airplane Mode icon so that it's highlighted. An airplane icon will replace the signal strength indicator in the screen's top corner. Wait a few seconds, then tap the Airplane Mode icon again to turn it off. Your iPhone should reconnect to an available network, hopefully with a stronger connection, and your texts will go through. If your texts still can't send, try another very basic thing: make sure you're sending it to the right place. Check the recipient's phone number or, if you're sending via iMessage, email address. Sometimes apps just need to be quit and restarted to solve problems like this. Learn how to quit iPhone apps in How to Quit Apps on the iPhone. Use the instructions there to quit the Messages app. Then open it again and try sending your message. Restarting your iPhone can solve a large number of problems. It may not fix things in this case, but it's a quick, simple step that's worth trying before getting into more complex options. Learn how to properly restart your iPhone and then try it. Maybe your iPhone not sending texts has nothing to do with your iPhone. It could be Apple's servers. Check out the company's System Status page and to see if there's a problem with iMessage. If there is, you'll have to wait for Apple to resolve it. Not every phone company supports every kind of text message. There's pretty broad support for SMS (short message service). This is the standard kind of text message. Not every company supports MMS (multimedia message service), which is used to send photos, videos, and songs. If you're having trouble sending texts and nothing on the list so far has worked, it's a good idea to check with your phone company and confirm that they support the kind of text you're trying to send. In the SMS/MMS section, make sure that the sliders next to MMS Messaging and Group Messaging are both set to on/green. With that done, try sending your message again. Move the Set Automatically slider to on/green. If it is already on, move it to off and then turn it back on. Move the iMessage slider to on/green. Try sending your text again. Tap Reset Network Settings, then enter your passcode. In the pop-up menu, tap Reset Network Settings. Your iPhone has a hidden carrier settings file that helps your phone and the company's network know how to communicate to place calls, transmit data, and send texts. Phone companies periodically update their settings. Making sure you have the latest version can solve some problems by updating your carrier settings. If you used to have an iPhone but switched to Android and are having problems with your texts, Apple's got a solution for you. Learn all about it in Fix the iMessage Android Bug With This Simple Free Tool.